Clutching onto the Contra Proferentem Rule? Have you entered into a contract and later found an ambiguity in the terms of that agreement? This is not uncommon and is often the cause of dispute between the contracting parties, at which point the contra proferentem rule is relied upon. 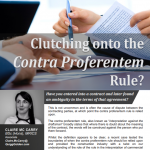 The contra proferentem rule, also known as “interpretation against the draftsman” broadly states that where there is doubt about the meaning of the contract, the words will be construed against the person who put them forward. Whilst the definition appears to be clear, a recent case tested the boundaries of when the contra proferentem rule should be relied upon and provided the construction industry with a twist on our understanding of the role of the rule in the interpretation of commercial contracts. The case of Persimmon Homes Ltd & others v Ove Arup & Partners & another , EWCA Civ 373 presented an interesting argument over the interpretation of wording within the Contract. The agreement between Ove Arup & Partners Ltd (“the Engineers”) and Persimmon Homes Ltd (“the Developer”) contained an exception clause which provided that the Engineers’ “liability for any claim in relation to asbestos is excluded”. On commencing the works, the parties found that the site was heavily contaminated by asbestos. A dispute arose, and the Developer sought to argue the meaning of the clause. Persimmon suggested that the clause was ambiguous and should be interpreted against Arup, as the drafter, and be “limited to liability for causing the spread of asbestos”. On referral, the Court of Appeal held, in short, that the wording excluded all liability relating to asbestos, including liability arising from negligence. It determined the clause was clear and absolute, and that the words are to be given the natural meaning which anyone reading the contract would have inferred. The decision goes against the argument that implied terms existed in the drafting of the exclusion; “liability for any claim in relation to asbestos (unless incurred in negligence) is excluded”. the words of a contract to such a degree and limit their effect to such an unlikely event. The ruling shakes confidence in the certainty of an outcome if the contra proferentem rule is the argument you rely on. If goes to suggest the rule has a very limited role in relation to commercial contracts negotiated between parties that have equal bargaining power as, in such cases, the Courts will likely take the view that it should not disturb the parties’ agreement by implying words into the terms of the contract. It remains that the natural meaning of the words used, with commercial sense and context are the key tools for construction contract drafting. This acts as a reminder of how important it is to understand risk allocation. Negotiations should also be carefully recorded and agreed by way of careful contract drafting. Should you require any advice, Quigg Golden can provide drafting services for Employers or detailed Contract review services for Contractors.